The skipper or jack as they’re known have a place in my heart. They’re small, scrappy and aggressive. They’ll hit a fly, sac or minnow with reckless abandon. Once hooked, they show their youth with athletic leaps and runs. I liken them to a gang of rambunctious wayward kids. One minute they wreak havoc and you have your hands full, then the next, their gone. They love to show their toughness by egging the larger males on the redds. During the spring, I’ve witness them slowly moving into position just out of sight of the largest male. They’ll get as close to the hen as possible. The male seeing the smaller antagonist often gets enraged and will give chase. This game of cat and mouse is often drawn out and the end result is the jack always escapes from the jaws of the larger male. During the salmon runs, skippers often play the same game as they pick off eggs just feet way from the massively kyped males. Skippers can be caught throughout the season and spring is when skippers are the most abundant here in Ohio. Skippers are generally between 1 to 2 years old as Ohio stocks them as smolts. Once they reach Lake Erie, they feast on the bounty and some can double their size in one year. Skippers are either sleek or morbidly obese. 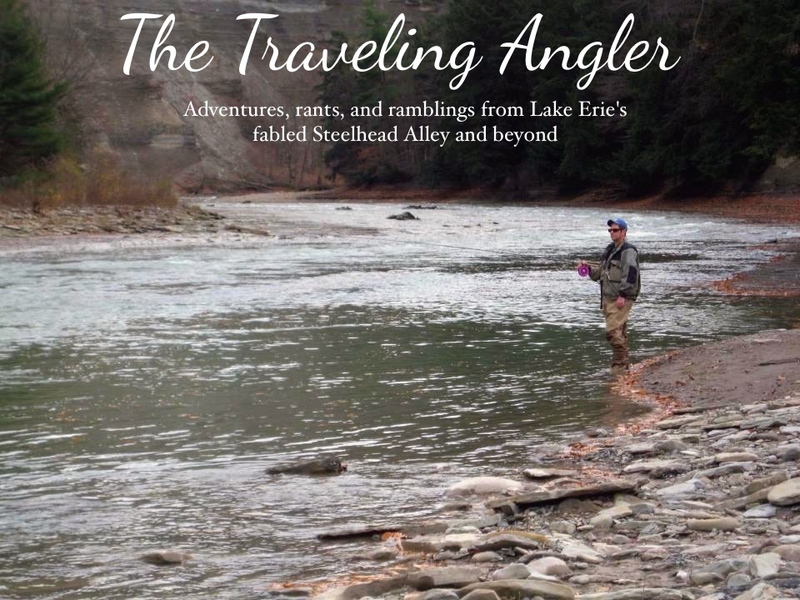 The ones at the power plant gorge themselves on the endless supply of shiners and shad. I've caught some that resembled footballs. 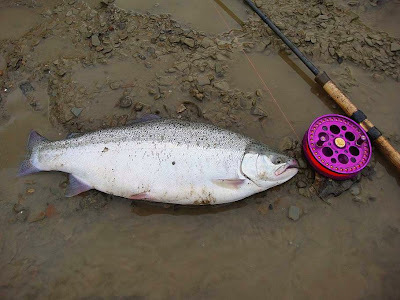 During the annual run, some will join the adults making the journey upstream to spawning grounds and some are content staying in the lower sections feeding on bait fish. When the bite is on, the action can be fast and furious. Unlike some of the older and wiser adults, skippers don’t discriminate when it comes to an offering. There have plenty of times when the float trots downstream in peaceful fashion when its taken down in sudden fashion. No teasing taps or boggles, just a hard takedown. When the hook is set, the water erupts with sleek silver missile being launched. In its attempt to free itself, the fish darts up and down stream. But I have seen skippers snap the line due to their hard fights or as I like to say “should of checked the line” with a slight smug grin. During the spring run, the majority of steel headers are found upstream seeking out the gravel sections for the larger fish. While I do like fishing the upper reaches for drop backs, I often prefer the lower sections as late arrivals and skippers often found here. Skippers often prefer faster water and seek out the runs, riffles and pocket water. In most cases, you’ll hear the smacking of water as they give chase to shiners. One year when the Rock was running low and clear and the shiners had finished their spawning run. There was hardly anybody out except for the larger pool upstream. Whenever conditions are low and clear in the spring and favorite of mine are single eggs. Single eggs can be either salmon or steelhead egg cured in muric acid. The muric acid gives the egg a rubbery feel and hook piercing it will not burst it. Due to the small size of the egg, I often use either size 16 or even 18 hooks. Some anglers prefer to have the entire hook inside the egg. There was a run that ran along the shale cliff and there was downed trees in the water. The shale bottom had several grooves and ledges. Even though the water was clear, fresh steelhead can often blend into the surroundings. I knew where the fish would be hiding - the dark water. The dark water was probably no larger than a loveseat, but big enough too hide some fish. With a single egg and a small BB shot. I gently tossed the float and watched it slowly drift downstream. The float inched closer and closer to the tree and gradually moved under one branch. The float popped and I set the hook. The water erupted and skipper leaped from the water with a smack. Several people walking along the trail above the river stopped and watch the battle ensue. The battle was fairly short albeit furious and I released the little fella and watched dart back under the same tree. I repeated the same process working the darker water using a fairly small unassuming egg. Despite there easiness to catch and willingness to bite, there are times when I prefer the skipper over the larger adults. Yes, the adults are much stronger and more wily with age. But they can’t match the intensity and playfulness of youth. Will It Be The Lion or The Lamb?